Google AdSense is the best ads network company to monetize a blog or a website. Many other Ads networks are available in the Internet but AdSense is the first Ads network that comes to mind of every Blogger to monetize money their blog or website and earn a lots of money. Some people starts Blogging for Passion or to Become popular in world wide web. But most of the blogger start blogging to make money with AdSense. Some newbies blogger apply for AdSense without reading and knowing about the Basic Rules of AdSense and finally get rejected. So, in this article I just shared my experience about the common reasons why AdSense reject you and How I Got Google AdSense Approved in first attempt. What is Google AdSense and how It is Better? Google AdSense is one of the oldest and Trusted Ads publishing company. With the AdSense we can earn decent money if we do our work in right way. One of the biggest reason for choosing AdSense is that it's paying rate is better than the all other ads network which is highly important for all bloggers and wapmasters. So, Google AdSense is number one choice among for among all other available ads network. 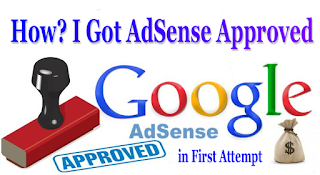 Move forward to know How to Approve AdSense Easily. Common Reason Why AdSense Reject an Application. Insufficient content/Content Issues: That means, your website/blog do not have enough text or enough text or enough number of content on them for Google specialists to review. Also, if your blog/website contains copyright materials or other illegal material such as Hacking, cracking, pirated softwares etc content then your AdSense application will not approved. It will be rejected in second review. Design/Layout Issues: Blog/site with poorly designed or not complete design and too less number of content/pages is considered as under construction. So you must have a good design and which looks beautiful and good layout. Site does not comply with Google policies: AdSense usually reject the blog which have no rich, unique and meaningful content, which are not getting organic traffic, Content which are not valued to users, Bad user experiences, poor designs. In addition, your blog may rejected for non-supported language. Check which are AdSense Supported Languages. How to Get AdSense Approved in First Attempt? First & Most Important point to be considered for Getting Approvalof your blog or website by Google AdSense is Content of your blog. Nothing new if i again say "Content is King" because it is mandatory for every good blog to have good quality and unique content. Always write high quality, attractive and Unique article which are valuable for your reader. Write in your own word and never copy from other blog or from other source. You are thinking about length of article? Well, article with 500+ words considered as good so try to write in 500+ words. In my judgment, it is not possible to clearly describe any topic in 100 - 200 words. If you are newbies in blogging then try to write 100% unique article in minimum 300+ words. Always give "ALT" tag in images because every small things matter in AdSense Approving process. Read How to Create a Free Blog on Blogger in Just 2 Minutes. Custom domain matters a lot. For a good blog, along with good article you must have custom domain to get AdSense Approved. Various websites (Such as Godaddy, BigRock etc) are available in internet which provides the facility to get domains name at low price. AdSense will never approve any blog or website with sub-domain. So, i recommend you to buy a Top Level Domain Name (.COM, .NET, .IN etc) for your blog. About Us: It describes about you and your blog/website. Without About Us page how the AdSense Team will know what your blog is about?. It will also make readers trust upon you. Contact Us: Contact Us page tells Google AdSense team that we care for our customers, visitors and we are ready to help them. They can speak us any time about our content, blog and for many other reasons. So, ensure that your blog should have working Contact Us page. There is zero chances of getting AdSense approval if your blog doesn't have such page. So, before you apply for AdSense make sure your blog have above mentioned page. You can also add Disclamer and Terms & Condition page, however these are not necessary for Adsense approval but there is no loss in having it. The domain age plays a very important role in Google AdSense approval process. As AdSense policy, your domain age should be minimum of 6 months. Now tell me, can you wait for 6 months? Don't worry you can get AdSense before 6 months. How? because AdSense Team is not looking for 6 months old domain. However, If you fulfill AdSense criteria before 6 month means, if you have a well established blog/website with high quality content then AdSense may Approved for AdSense just in 2 months. So, before you apply for AdSense make sure your domain is atleast 45+ days old. This is one of the common question that comes to mind of every blogger or wapmaster. Number of post isn't given officially it depends on the quality of content. Generally it have been been that many blogger enjoying making money with Google AdSense with even 12-15 posts and there are numbers of blogger who are still rejecting with over Hundreds of posts in their blog. According to my experience, make sure your blog have atleast 15+ High Quality post. This is the common mistake that most of the newbies blogger made. They just copy article from other blog and post on their blog, apply for AdSense and finally got dis-approved. If you are doing copy paste then you are just wasting your time. Not today but tomorrow you will need to delete that content. Never copy any article from other blog because Google AdSense team will not approve such blog. Always make all external link "nofollow"
Traffic is not a big point in getting AdSense Approval but, tell me seriously, without traffic how will you earn good money with Google AdSense? Therefore traffic is most important in making money not only with AdSense, for other ads network too. If you'r getting traffic from US and Canada or getting good Traffic then there is more chances of getting AdSense Approved. Google AdSense team isn't not looking for blog which have good Page Rank or Alexa ranking for approving AdSense application. But if your blog have good ranking then it is PLUS point for you. Checkout How to Improve Alexa Ranking in Short Time - Top 11 Alexa Tips. The template that we apply on our blog plays major role to establish a good interface between user and blog. The template should must be responsive. If you are confused, not able to decide whether which template to use then I recommend you to use those template using which someone have got approved AdSense for their blog. Checkout: Top 10 SEO Optimized & AdSense Friendly Responsive Blogger Templates. If you have still not read Google AdSense Terms & Condition the i strongly suggest you to read them line by line. If you have placed any other Ads such as Chitika, Infolinks, Clicksoror anything, its time to remove them all. Even Google AdSense allow you to use ads of other ads network along with them but its better to remove these all other ads and don't put back until you get Fully AdSense Approved. This not not necessary for AdSense approval process but better to have a simple title and not too long description. So the AdSense team can easily understand what your blog is about. This is because during approval process AdSense team will manually review your blog. A favicon is an icon associated with a website or blog which Web browser use them in the URL bar, on tabs, and elsewhere to help identify a website visually. A Fevicon will not give you AdSense but there is no loss in having it. If you replace blogger default Fevicon by own Fevicon to your blog or your website, it will increase uniqueness of your blog/website. If you have already applied before and got dis-approved by Google AdSense then don't apply for again and again before resolving the issues. Apply for AdSense on www.google.com/adsense. Fill all your information correctly. You must enter website URL in www.YourSite.com not in Subdomain form. Second day, login to AdSense and create 300x250 ad unit code and place it in your blog in Sidebar (or anywhere which can be seen from all pages). Now don't login and do anythings just wait for the Mails from Google AdSense Team. Checkout Top 5 Highest Paying URL Shortener Websites to Make Money Online with/without any Blog/AdSense. This was how I got AdSense Approved in First Application after knowing every small point of AdSense policy. I hope you have got all solution/answers of your question related to AdSense in this post and need not to go anywhere for more tips. Don't forgot to share your views/experiances with our readers, if you have any problem in Getting AdSense, feel free to ask by commenting in below comment section. Follow above Killer Tricks to Get AdSense Approved very Fast. Happy Blogging & Stay Tuned.